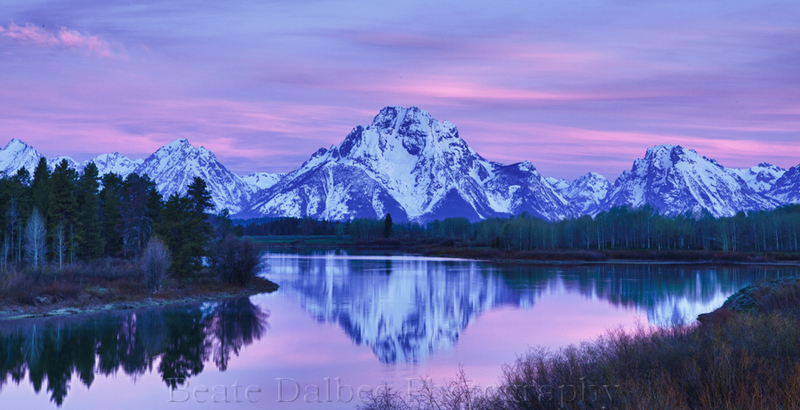 I could not have asked for a more beautiful sky that early morning at Oxbow Bend. And fortunately there were no crowds of photographers either. A beautiful start to the day in the Grand Tetons! Moments like this are so worth the early wake-up call. More images from my trip to the Grand Tetons and Yellowstone can be found here. It looks so peaceful, Beate and what serene colours–some of my favourite in fact. I’m really enjoying all the images you made while on your trip and looking forward to seeing some more. Thank you Sabrina. I just love the colors of the early morning light. This photo amazes me on many levels. The serenity of the scene coupled by the subtle, yet, stunning colors makes this one of your best shots. Thank you Beate for sharing this. thanks so much – the light was just so beautiful that morning! Beate – This is beautiful! The pink clouds are a perfect complement to the blue and white in the peaks. The fact that you enjoyed some solitude is a huge bonus, too. Images of Oxbow Bend always convey such beauty and peace, which is often the exact opposite of the actual experience. Thank you Sarah. Yes, I have heard of “tripod battles” at that spot in the fall. So I really appreciated the peacefulness there that morning.